The cover is carved in low relief with a lady on a misty riverbank gazing at the reflection of the moon beneath pine and prunus branches near large pierced rockwork. The underside of the box depicts a western figure grasping a ribboned ball playing with a lion, its head upturned in anticipation. The side of the box and cover is decorated with floral scrolls partitioned within keyfret bands. The ivory is well patinated to a rich warm yellow tone. 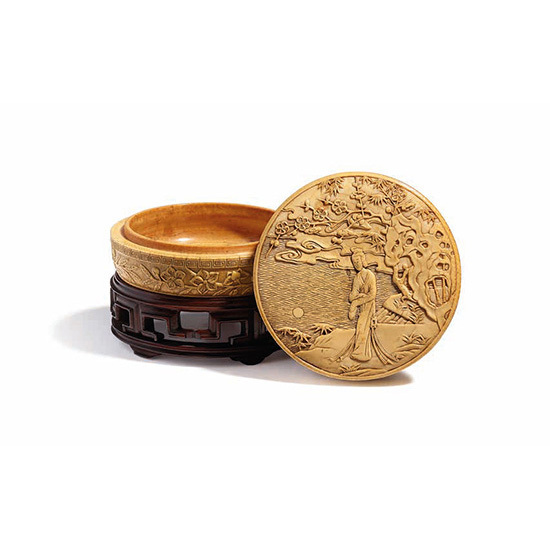 The shape of the box is made in imitation of contemporaneous cinnabar lacquer incense boxes. A cinnabar lacquer example of similar shape, dated to the 16th Century, is illustrated in Carving the Subtle Radiance of Colors: Treasured Lacquerware in the National Palace Museum 和光剔採：故宮 藏漆, Taipei, 2008, p. 64, Catalogue No. 42. 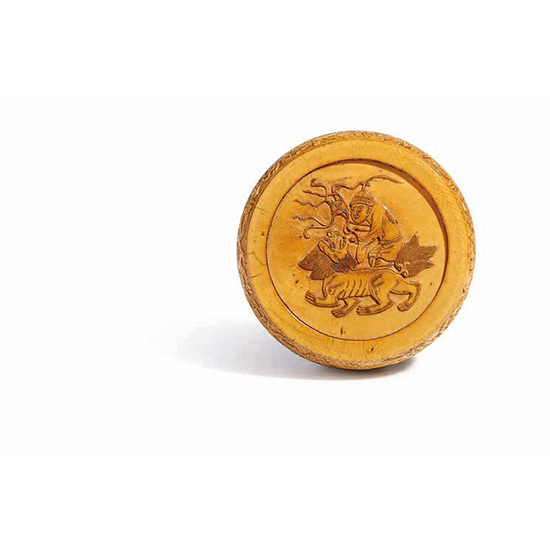 The lion’s mane carved on the underside of the box is stylistically similar to the dragons and beasts during the Jiajing and Wanli reigns of the Ming dynasty. A Jiajing lacquer dish with a unicorn motif, belonging to the Palace Museum, is published in The Complete Collection of Treasures of the Palace Museum Volume 45: Lacquer Wares of the Yuan and Ming Dynasties 故宮博物院藏文 物珍品全集45：元明漆器, 2006, p. 173, Catalogue No. 131. A cinnabar lacquer example of a tiered box with similar banded scrolls, dated to the Mid-Ming period, is illustrated in The Complete Collection of Treasures of the Palace Museum Volume 45: Lacquer Wares of the Yuan and Ming Dynasties 故宮博物院藏文物珍品全集45： 元明漆器, 2006, p. 142, Catalogue No. 104. Another example in zitan is published in Zhongguo zhumu yajiao qiquanping Volume 3 Part 2 中國竹木牙角器全集3：木雕器（下）, 2009, pp.158-159, Catalogue No. 132.